I went into the store this last weekend and the Christmas department was already set! While everyone was elbowing their way through the Halloween costumes, I strolled down the empty Christmas aisles looking at everything for the first time. I love checking out the color trends; mini ornaments that make great package toppers; and testing out the glitter ornaments to see if I could handle that kind of glitter in my home. Unfortunately, the glitter got put back - but I found this wire tinsel! I knew right then that I needed to make a "snow globe" wreath card with Pink Paislee's new Merry & Bright collection! I started creating a "package look" by adhering burlap ribbon to the front. I built my "snow globe" by using a Shake It shaker card pouch by Impression Obsession. They are just great! They already have adhesive on the back so all you get to do is dress it up inside and out! I made a little snow scene inside using a Swiss Dot embossing folder to white cardstock, then added trunks to the Merry & Bright ephemera trees. I have clear confetti also inside so that it really shakes like snow globe snow! The tinsel wire was in the "miniature tree" section at the store and was created to be mini garland. But, I just love it! I just snipped it with wire cutters and hot glued it to the rim around my shaker. This collection is so much fun and I can't wait to make some more! I am having a blast! 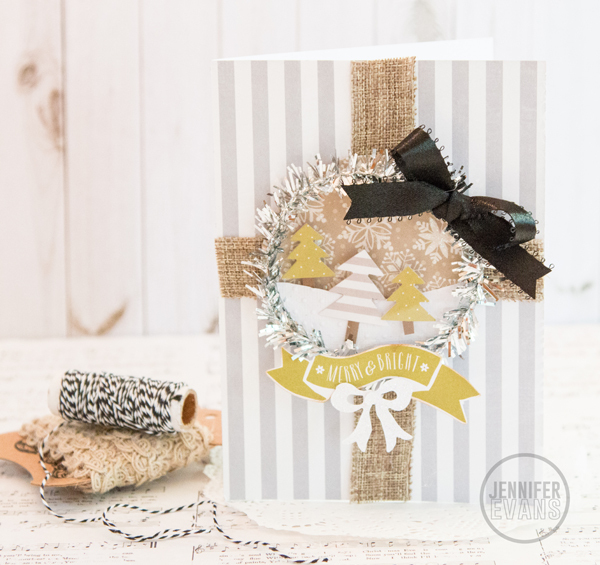 Create Well: Think outside the box and find items that are small enough to add to a card that might not necessarily be in the crafting department. This is beautiful! You've put me in the mood for Christmas crafting now! Thank you so much Michelle!!! It means a lot! I LOVE this new collection. I can't wait to create more!